Synopsis (From Goodreads): Beat the game. Save the world. Pandora’s an average teen, glued to her cell phone and laptop, until the day her long-lost father sends her a link to a mysterious site featuring photos of her as a child. Curious, Pandora enters the site, unwittingly unleashing a global computer virus that plunges the whole world into panic: suddenly, there’s no Internet. No cell phones. No traffic lights, hospitals or law enforcement. Only Pandora’s Box, a virtual-reality game created by Pandora’s father, remains up and running. Together with her neighbors, gorgeous stepbrothers Eli and Theo, Pandora must follow the photographs from her childhood in an attempt to beat the game and track down her father—and rescue the world. 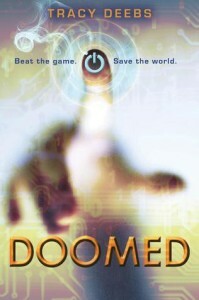 Part The Matrix, part retelling of the Pandora myth, Doomed has something for gaming fans, dystopian fans, and romance fans alike.